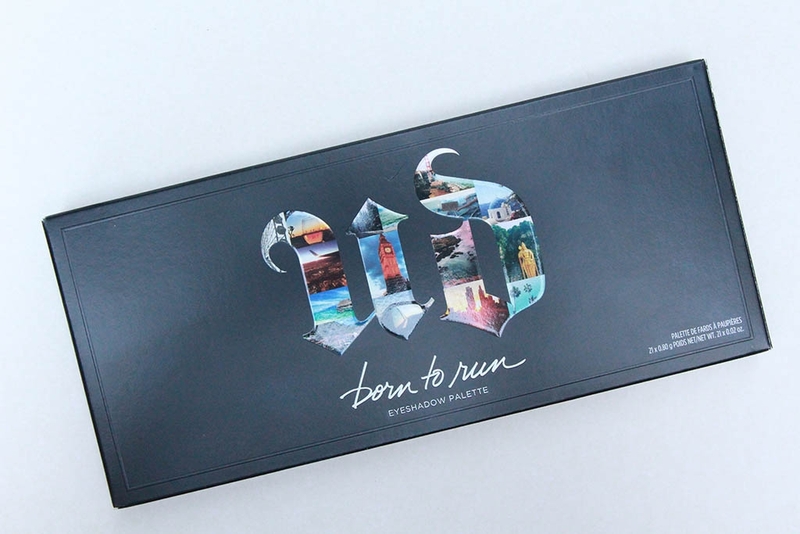 Let’s start with the packaging because, honestly, all palettes should be housed in such masterpieces. 😄 It’s a very sturdy, but sleek plastic casing with a good magnetic closure. It’s not too sturdy of a magnet, but I don’t fear that it’s easily going to be knocked open either. If you’re into having a mirror in your palette, this one is fantastic! I personally don’t much care whether a palette has a mirror or not, but this mirror is fantastic quality, as well as being essentially as large as the palette itself – so a good size. Urban Decay has ditched including the standard brush (though they did typically include quality brushes), leaving nothing but shadows from edge to edge. Not an inch is wasted and it’s brilliant! 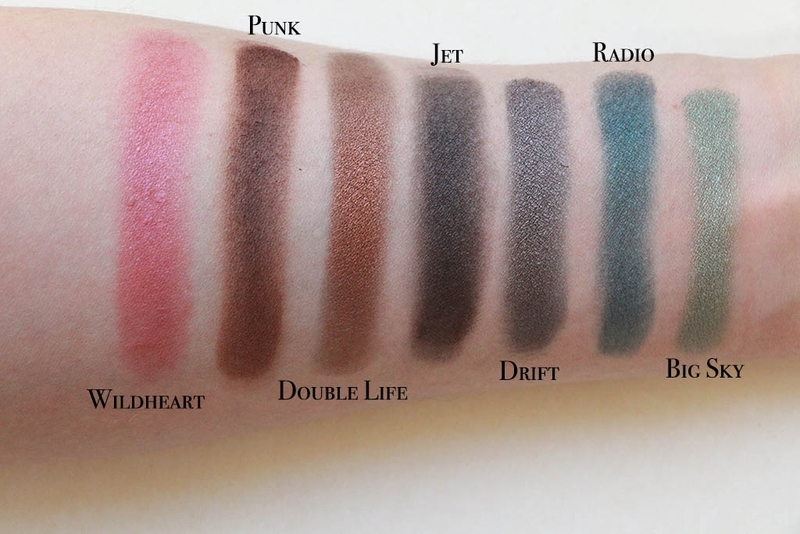 The palette is just a touch on the larger size, but then you’re getting a ton of shadows and it’s not obnoxiously big – you can still hold it in one hand with ease. 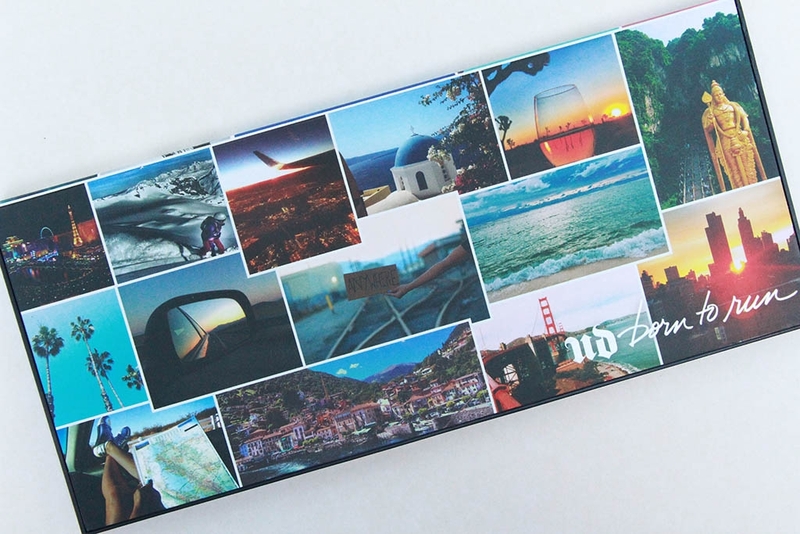 Though it’s not a tiny palette, it’s quite slim and will easily fit in a bag if you’re traveling with it, so it’s actually a great size with no wasted space. I’ll take that! The outside is decorated with photographs from across the globe to stick with their “born to run / wanderlust” kind of theme. It’s a fun, tasteful and still grownup looking palette. They’ve really nailed the packaging for this palette! Ok, on to the more fun stuff – the shadows! 😝 You get 3 rows of 7 shadows – so a total of 21 shades. That’s a lot crammed into a palette this sleek! Each pan weighs in at 0.8g / 0.02oz. which is just about half the size of a single Urban Decay shadow. The full size shadows weigh in at 1.5g / 0.05oz. 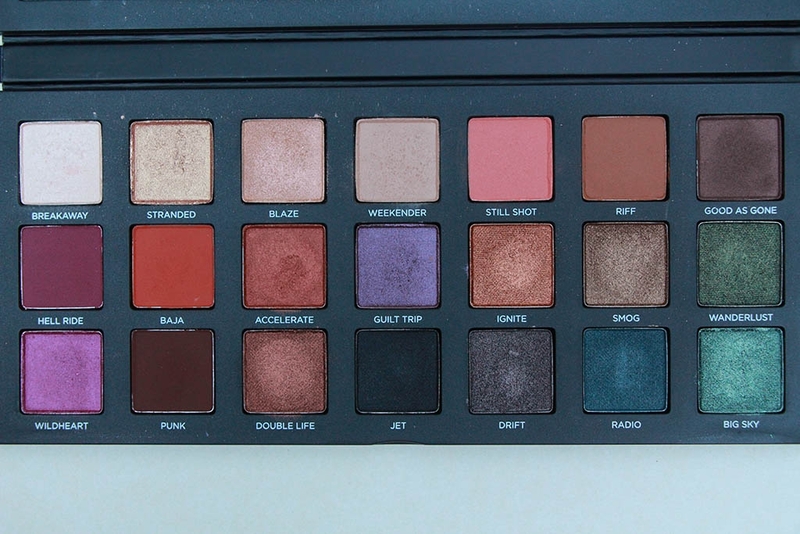 The pans are the same size in comparably sized Urban Decay palettes (the Vice Palette has 20 shadows that are 0.8g / 0.03oz each). So it’s a good size for a palette with so many shades. Retailing for $49, it’s a great value and, as I understand it, this will be a permanent offering! 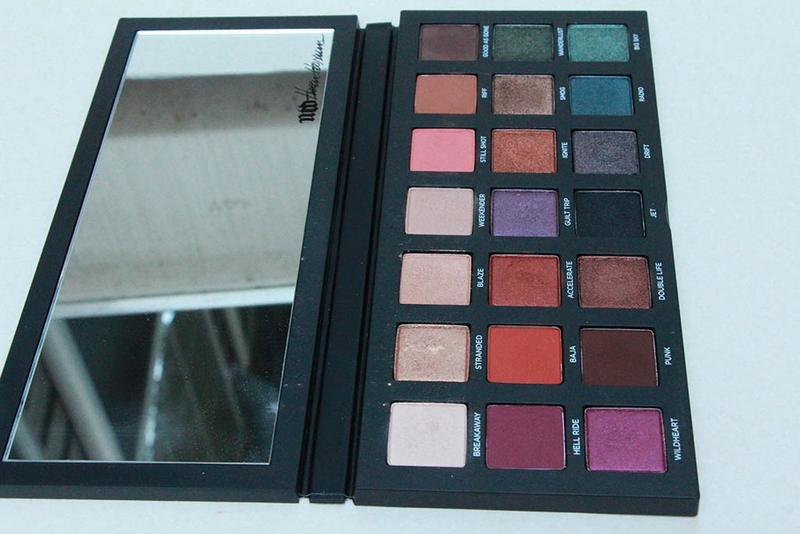 As far as the shades included, I think Urban Decay really nailed it! There is an amazing mix of predominately warm neutrals, but with touches of wearable color. 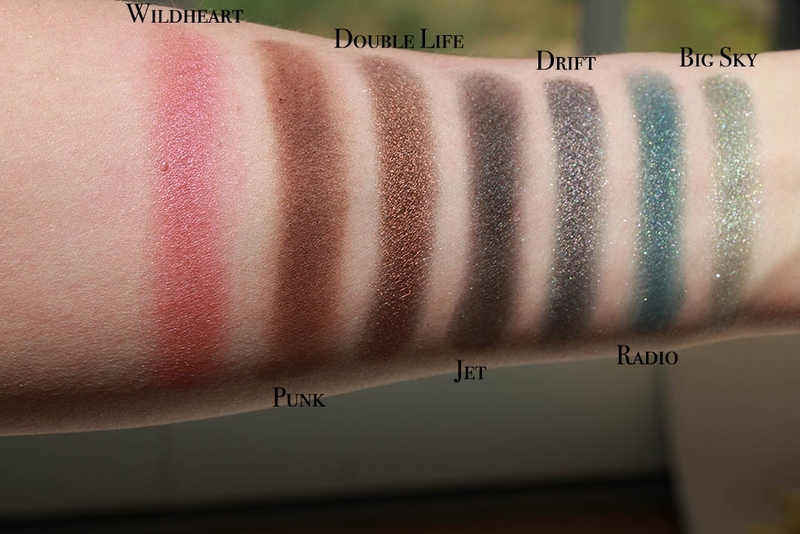 Not every shade is brand new: Blaze, Riff, Smog and Punk are also available as single shadows, as well as in various UD palettes. Not a deal breaker for me. There are 6 matte shades, 8 metallic shades, and 7 satin / shimmer shades, some of which can be essentially matte depending on how they’re used. It’s a great balance of finishes, though if I were to be really critical, I do kind of wish that there was just one more matte neutral transition-type shade. Nothing I’m crying over though. If you noticed, I didn’t mention any glittery shades!!! 🎉 Urban Decay always throws in some of those glitter bombs that are practically unworkable, but they seem to have finally gotten the message that most don’t want that and, if one does, it’s not a big deal to grab something glittery from elsewhere. Even better, every shade – yes, I’ve used them all! – performs beautifully. In fact, let’s go into a bit of detail about each shade and how they apply…. Breakaway: Light white-golden sheen with just a touch of peach. Looks nice on the brow bone for a highlight on my skin tone. Stranded: Light golden-orange metallic. Beautiful shade that’s best applied wet or with fingers. Blaze: Gorgeous pale peach-gold duo-chrome metallic. Works best when applied wet. 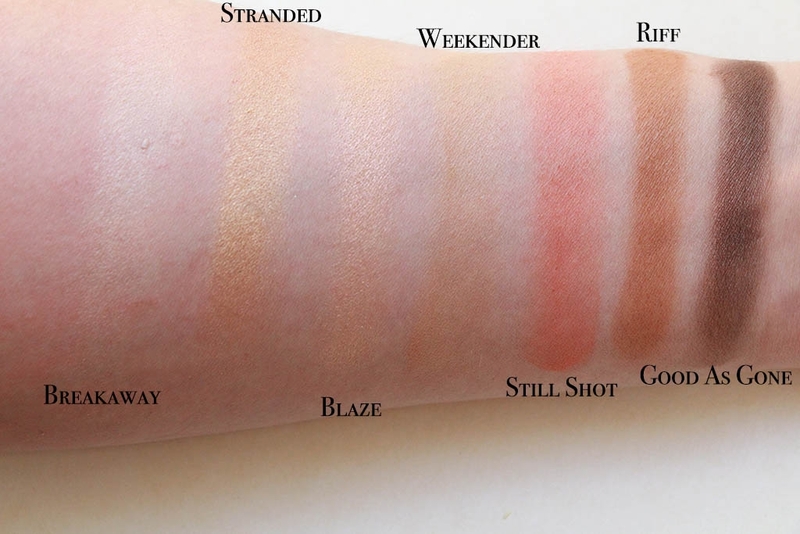 Weekender: Very light warm beige matte. It’s very soft & dusty when picking up with a brush, but it applies well to the eye. Doesn’t look like much, but it creates the perfect shadow on my skin tone. Still Shot: Medium-toned peachy-pink matte. Stiff shadow in the pan, but it picks up easily on a brush. Blends well. Very pretty shade. Riff: Very warm orangey-yellow brown matte. Love this! It blends beautifully. Just your beautiful warm brown matte, but a great shade for many uses. So glad it’s in the palette! Good as Gone: Deep, cool brown with a subtle satin finish. Buttery smooth, and it applies well to the eyes – a little more difficult to blend out, but it does blend. Hell Ride: Matte burgundy-plum. 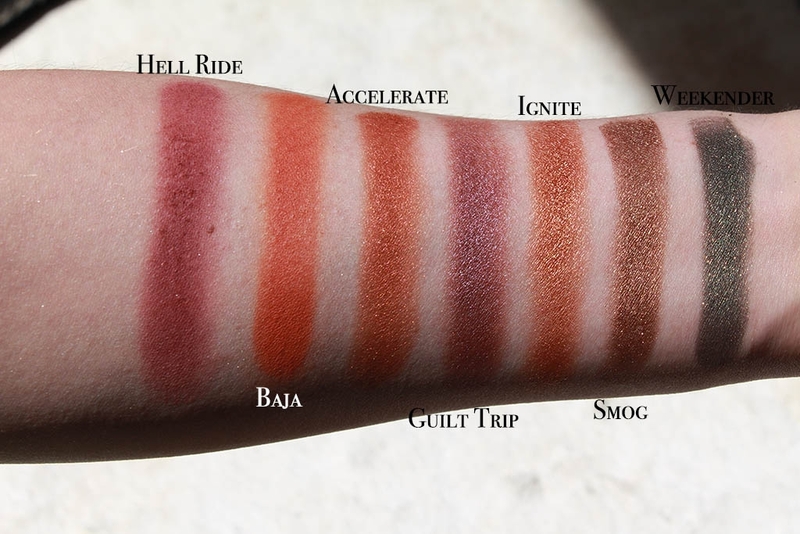 Really nice, pigmented and easy to blend shadow without a lot of kick-up. Baja: Intense matte orange. 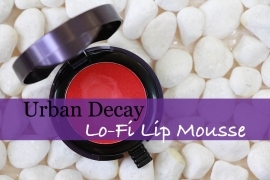 Blends well and is very pigmented – can be subtle when used with a light hand. Accelerate: Gorgeous rust shimmer. Best applied with fingertips, but it produces a bit of fallout when used with a brush. Guilt Trip: Nice purple with a satin sheen. Blends beautifully, no fall out & no kick-up. Ignite: Intense metallic copper. Beautiful shade, but a fair amount of fallout even after tapping off brush. Apples best with fingers. Smog: Nice bronze metallic. Doesn’t come across intensely foiled on the eye, though I only tried applying with a damp brush. No fallout. Wanderlust: Slightly glittery deep forest green metallic in a swatch. Have only used with a brush – it ended up looking like a deep forest satin the way I tried it. No fallout, and it blended well. Not as pigmented as I expected when applied with a brush, and I wish I had seen more of the brilliant metallic green that swatches. I suspect if you applied the shadow wet or with a finger the intense green would be more noticeable. It’s a great shadow and I suspect it’s versatile. Wildheart: Gorgeous fuchsia satin. Applies nicely without fallout, but it would be so pretty if it were metallic. Punk: Slightly red-leaning deep brown matte that’s good for deepening outer corners or lining. Blends well and a good staple in the palette. Double Life: A black-based orange-copper-brown metallic. Applying with a brush brings out the black, while applying with a finger brings out the warm tones. Pretty shade w/ multiple options for use. Pigmented when used all ways. Jet: Subtlest satin sheen on a beautifully smooth black that applies & blends well. Not the deepest black, but a great shade to have in the palette. Drift: Metallic blue-grey-green-purple duo-chrome metallic. It’s gorgeous in a swatch and intensely metallic. 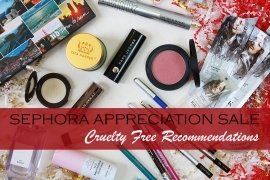 I have only used this to slightly deepen the outer corners and under the lower lash line – it performed well for both, but it wasn’t anything special when used for such purposes. Radio: Intensely pigmented deep teal blue shimmering satin. Applies beautifully without fallout. Blends great. Surprised by how intense this applied to the lid with only a brush! Looked almost matte when applied with a brush and blended out a bit. Big Sky: Metallic blueish seafoam green with a subtle glittery finish. Absolutely gorgeous metallic – no dampening of brush needed for an intense metallic / foiled effect. Applies metallic even with a brush! No fallout or kick-up. The color palette is also very well thought out. Pretty much every shade can work with pretty much any other shade without looking odd or forced. You have warm neutrals, pops of color and trendy hues. It’s truly one of the best color selections I’ve come across in a long time. 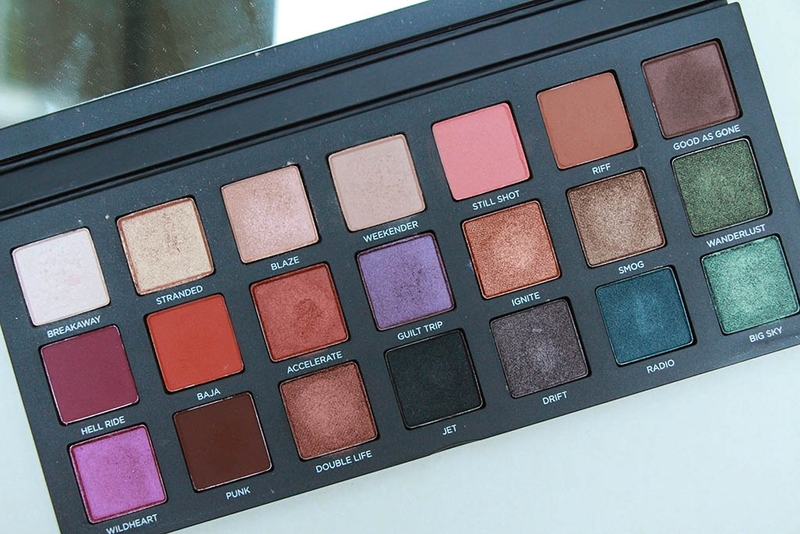 And then with the mixture of finishes – plus those shades that can work either as a near matte or intensified a bit to emphasize the sheen – you really do have pretty much everything you would likely need in just this one palette. 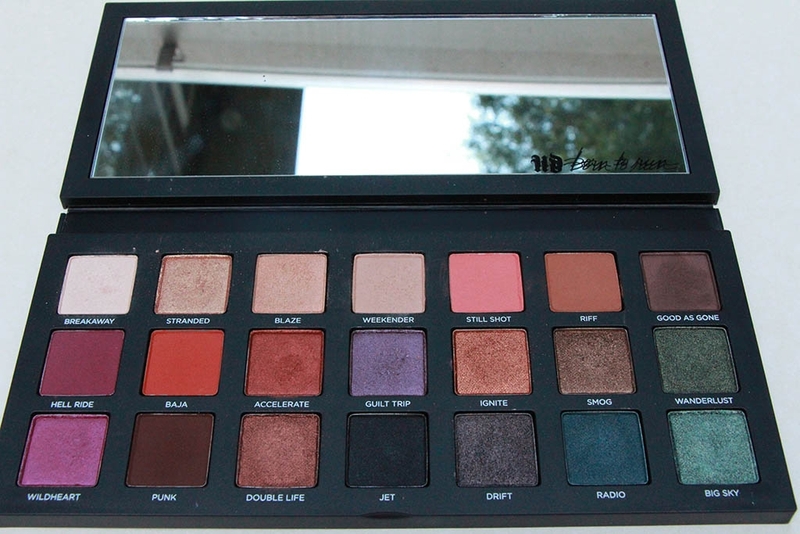 In case you can’t tell, I absolutely love the Born to Run Palette! 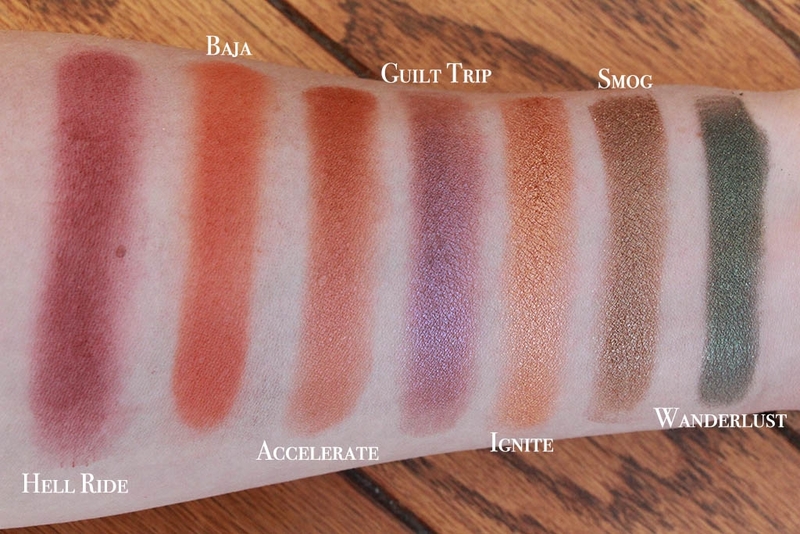 The quality of the shadows, the shade selection, the packaging…it’s just all spectacular! 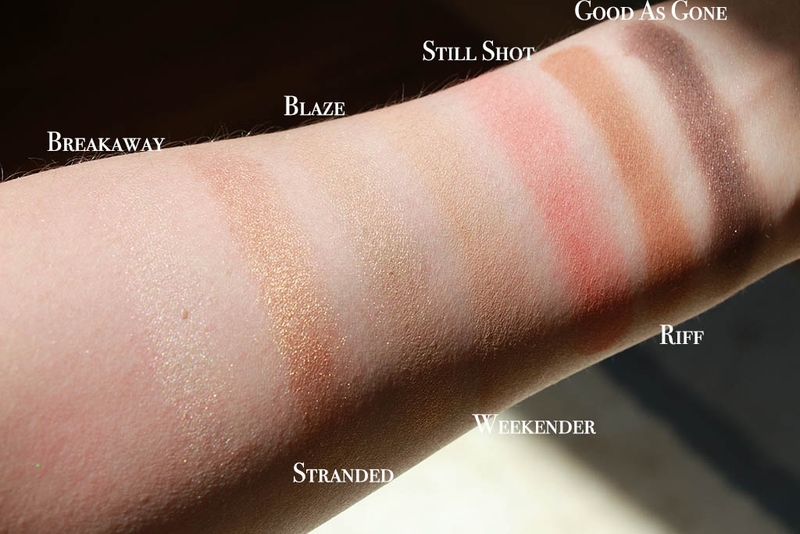 It’s also a palette that can create a pretty diverse range of looks, which is pretty rare…especially with a lot of Urban Decay’s more recent palettes (Naked Heat, I’m thinking of you!). These shadows are just such a joy to use and I find myself being inspired every time I look at the palette. 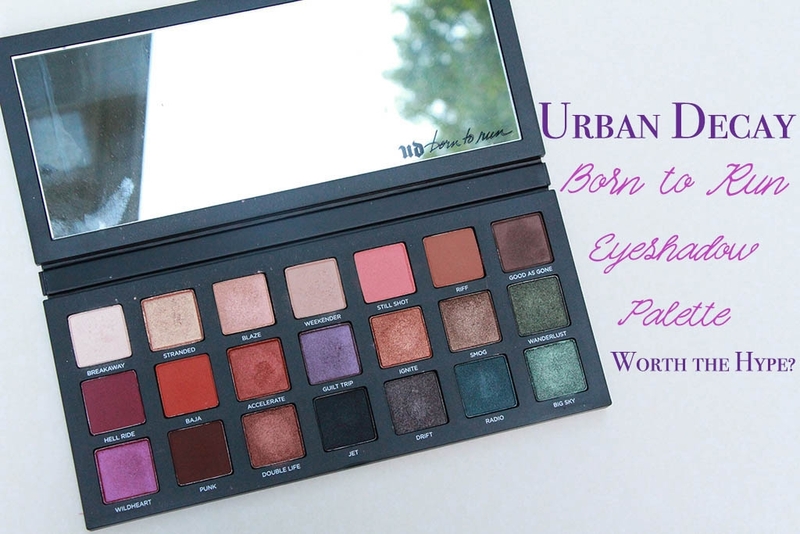 If you’re looking for a new eyeshadow palette with great quality eyeshadows that create a range of looks from basic every day to a bit more wild and fun, look no further than Urban Decay’s Born to Run Eyeshadow Palette!